The facilities at the Walt Disney World Swan and Dolphin hotels are first class, especially if you’re looking for the full Disney experience. 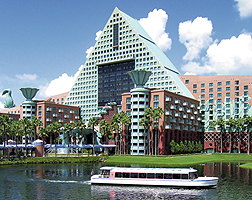 The location in the heart of the Walt Disney World Resort and the proximity to Epcot, Disney’s Hollywood Studios, Disney’s Animal Kingdom and the infamous Magic Kingdom parks makes it a much loved base for Disney fans from across the world. There are a number of facilities that the kids will love; from the dedicated Disney kids’ club, Camp Dolphin, to the breakfasts with some of the best-known Disney characters in attendance. The kids’ club is open from 5.30pm until midnight, which makes it the perfect place for the kids to chill out whilst adults grab some dinner – and during the day, there’s always the games room to keep the whole family entertained! Adults will also love the relaxing facilities at the Swan and Dolphin – from spa treatments to rounds of golf! Choose an afternoon of pampering at the Mandara Spa, where you can enjoy a facial after exploring one of the indoor gardens, or try a massage after a long day of running about the theme-parks. Alternatively, choose to try your skill at a round of golf on one of the four Disney golf courses, all just a short journey from the hotels. The whole family will be mesmerised by the miles of swimming pools available at the Swan and Dolphin. From the two lap pools which are perfect for an energetic swim after a day exploring Orlando to the fun pool with slides which is a great place to relax, there’s a wealth of places to chill by the water’s edge here. As well as five heated pools, there’s also the lake which can be explored – both by boat from the jetty, or from the footpaths which ring the shoreline. Evening entertainment includes Disney characters, karaoke, shopping or simply watching a film in your room – yes, a Disney movie of course! After a good sleep, there’s the jogging trails to wander, the health club is open and a game of tennis or volleyball may be underway – so there’s no reason to sleep in!